Anyone who worked with or met Marie Colvin, or consumed her extraordinary output, knew she was more than just a great journalist. She was also a huge personality bursting with compassion for the suffering that her reporting showed us. She was a compelling writer with an eye for the human detail and a strong sense of the urgent narrative of conflict. But she also believed passionately in the importance of what she and other journalists covering conflict were doing. She was killed doing that job along with French photographer Remi Ochlik. There was no doubt from her last reports from Homs in Syria that she thought this was as desperate a situation as any she has covered over the decades. There has been some awe-inspiring reporting from Syria over the last few months by both citizens and some very brave journalists. But Marie’s last dispatches were heart-stopping. They had the power to make you think properly about what was going on. You hoped they had that effect on politicians, too. Perhaps she was also naive, reckless and selfish. How could she put herself at such risk for journalism? Is any story really worth a life? Does this kind of bravado encourage less experienced journalists to put themselves in the line of fire? Colvin would be the first person to agree with all that. She would also point out that it is the civilian casualties that matter. She would also tell you to pay attention to the translaters, fixers, camera crews and citizen journalists who die trying to tell these stories. Colvin cared about the wider mission of war reporting. She implored media organisations to invest more in this expensive and risky part of our business. Most ‘war reporters’ I’ve met don’t actually like to be given that label. They know that they are in a unique field but they don’t want to be treated as ‘special’. That is true. We don’t want to foster a macho, gung-ho cult of the hack with a helmet. But war reporting is different and especially dangerous. The best memorial to her would be to renew and expand our commitment to ‘conflict journalism’. There have been great improvements over the last few years by media organisations in promoting safety but still every year many journalists are killed around the world. Governments and crimininals kill them as well as soldiers. 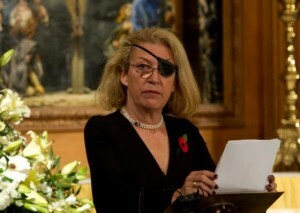 Let us pay tribute to Marie Colvin, but let us also support those trying to tell us the truth from the most dangerous places in the world.